There definitely aren't enough good Mexican joints in New York, so once my tickets were booked and I started planning my itinerary meals, I made finding Mexican food a top priority. 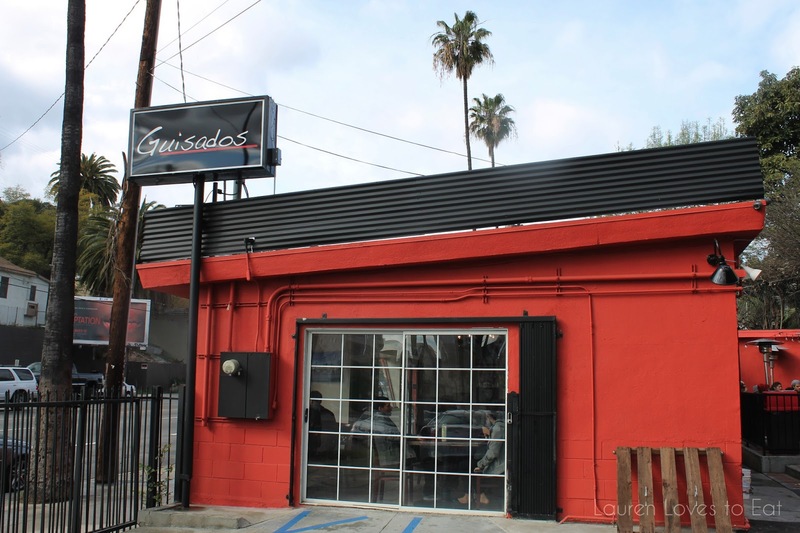 After doing some research, Jing and I decided to check out Guisados in Echo Park. Since we had to pack in a lot of meals for this very short trip, we ended up coming here right after lunch at Alcove Cafe. Yeah, indulgence is a big part of holidays for me. Nevertheless, I was so happily satisfied with these tacos and am ready for more. 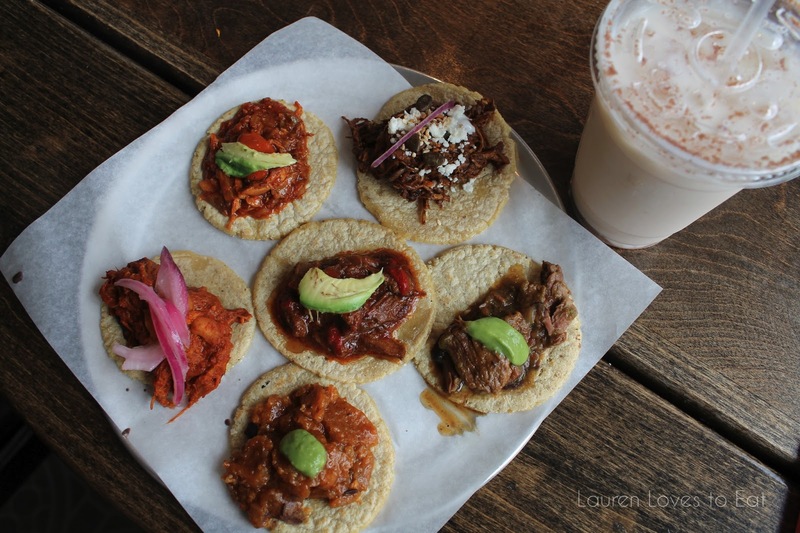 Guisados, please open up in New York. There are 5 parking spots in the restaurant's lot, one of which we were lucky enough to snag. There is a lot of street parking as well. The taco sampler, $6.99: 2 steak, 2 chicken, and 2 pork tacos. The tacos in the sampler are slightly smaller than individual orders of tacos. Single tacos are priced at $2.50, and include steak, chicken, pork, veggie, and seafood options. Clockwise from bottom: Chicharron (pork), Cochinita pibil (pork), Tinga (chicken), Mole poblano (chicken), Picado (steak), In the middle: Bistek en salsa roja (steak). All of the tacos were incredible and packed with flavor. My favorite was the bistek en salsa roja-- tender and very flavorful steak, but it definitely put my mouth on fire. Horchata, $2: I am a huge fan of these drinks. I mean, milk, cinnamon, sugar, and rice? Delicious combination. This is one of the best I've ever had. 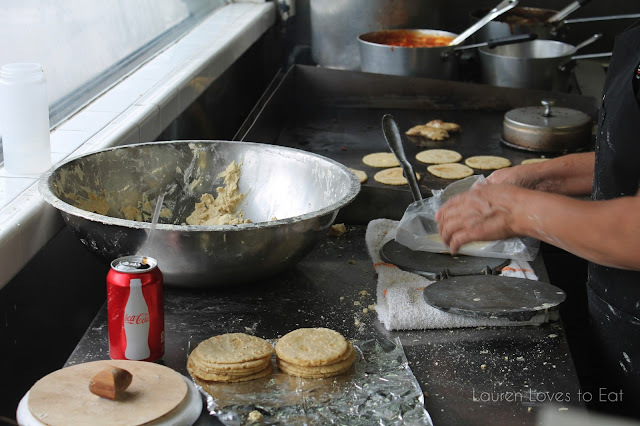 The handmade tortillas have the most perfect chewy texture to them. Beware though, as a result of the topping to tortilla ratio, I had sauce dripping down my hand while eating each one. We arrived at 2pm on a Friday, and after ordering 1 taco sampler, we had to wait around 25 minutes. The good thing was that it gave us some time to digest our lunch. Definitely worth the wait though! (There is also a location in Boyle Heights). Man, I'm starving look at these pictures. Totally agree that NYC needs better Mexican places, especially some good Mexican shacks. Lauren, after seeing these pics, I think I wouldn't even think about what animal I was eating.. it could be duck foi (spelling?) for all I care. lol. SO yummy!!! They look SO good, wish we had that place here in Canada!